Silicone bakeware is great. It is easy to clean, comes in bright colours, stored away small, is light-weight and is non-stick. Pretty and easy to use. I recently bought a bunch of muffin cases in the Habitat sale and find myself making muffins every second day. To have a good reason to make muffins, I’ve been experimenting with egg and dairy free corn muffins. Corn muffins because I love American corn bread. Egg and dairy free so that my vegetarian, dairy sensitive and currently detoxing live-in can have some too. (Hush. Don’t mention the sugar.) The recipe below yields six to eight moist corn muffins with a good chilli warmth. They go well with soup and make an easy breakfast for lazy people, like me. They are a fast way to make a tasty snack. Should you, like e rucola, have decided to spend a week eating only what you yourself have cooked, pack these when you go out. 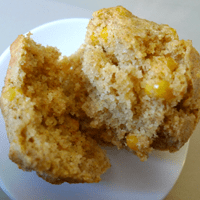 These egg- and dairy-free corn muffins are based on a recipe from Allrecipes, some experimentation, a memory of the recipe Danielle posted after Love Cooking and online research. The problem with egg-free is getting an egg-like texture. I want my muffins to rise, taste good and not be too stodgy. These do the trick. The original recipe calls for egg-replacement and yellow corn flour. I’ve used gram flour and water to make an egg replacement and polenta. To make the muffins more lunch than dessert I’ve added chillies, sweet corn and a bit of allspice for a rounder flavour. Preheat the oven to 230 degrees C (I have a fan oven so put it at about 200). Put eight silicone muffin cases on a baking tray. Beat together the gram flour and cold water in a small bowl or mug. Combine the polenta and soya milk in a larger bowl and leave while preparing the rest of the mixture. This helps moisten the corn flour. In a small bowl, combine flour, baking powder, sugar, chillies and allspice. Add the sweetcorn and the gram flour mixture to the polenta. Add the flour mixture, the water and the oil to the polenta. Stir swiftly to make a smooth but fairly stiff batter. If the polenta has absorbed a lot of the soya milk, you might need to add another 0.5 dl water to loosen the batter. Divide into six to eight muffin cases. Bake for 10-13 minutes. The muffins are done when a toothpick stuck in their centres come out clean.